It's getting cold out, and my endurance on outside projects is waning as a result. This is not my time of year for outside projects, as evidenced by last year's lack of posts in this timeframe. This is when I catch up on reading and planning. I shared the blog on reddit yesterday, so if you're coming here from there; welcome. 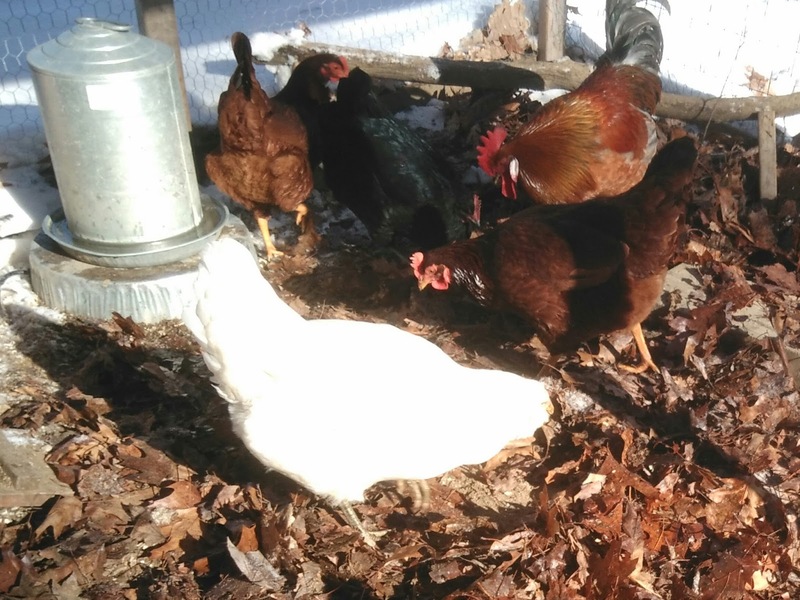 One kind redditor recommended taking all the leaves from the pile behind the coop, and using that as bedding in the chicken's run. I moved in a few buckets of leaves today, and it was received very well by the ladies. Based on his vocal range, the rooster has been named... Roy Orbison. I'm not naming any of the other birds, so I don't get attached to them, and feel bad when my dog (or a hawk, or a coyote, or an owl...) kills them. On Lloyd Kahn's shelter blog a few months ago, Evan Kahn posted a video of how Lloyd washes dishes (it's surprising what you find exciting on the journey to frugalism.) Guess who's kitchen that shelf rack is in? 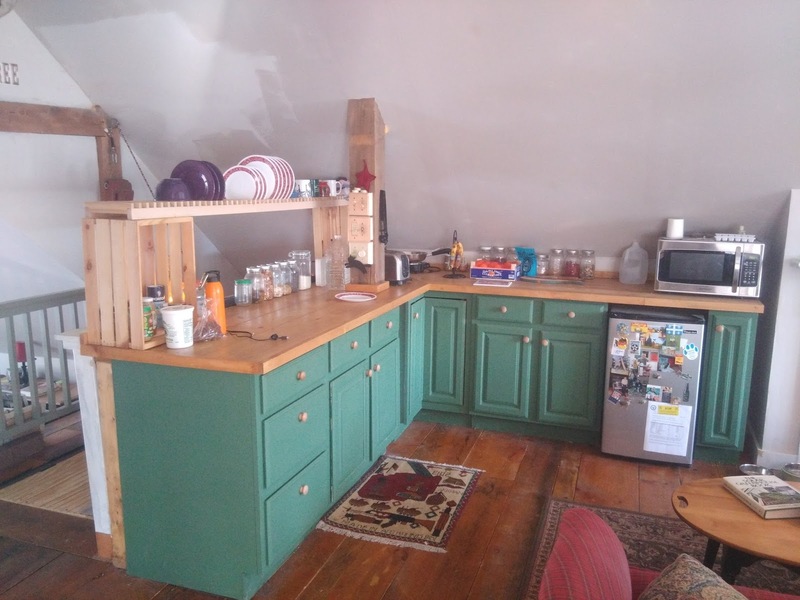 The guy that wrote the book on tiny homes, and small homes, and handmade shelter. It's in his kitchen. Doesn't that make sense? at about 1:30 Lloyd talks about it. I used the barn's kitchen as a test dummy for my shelf. 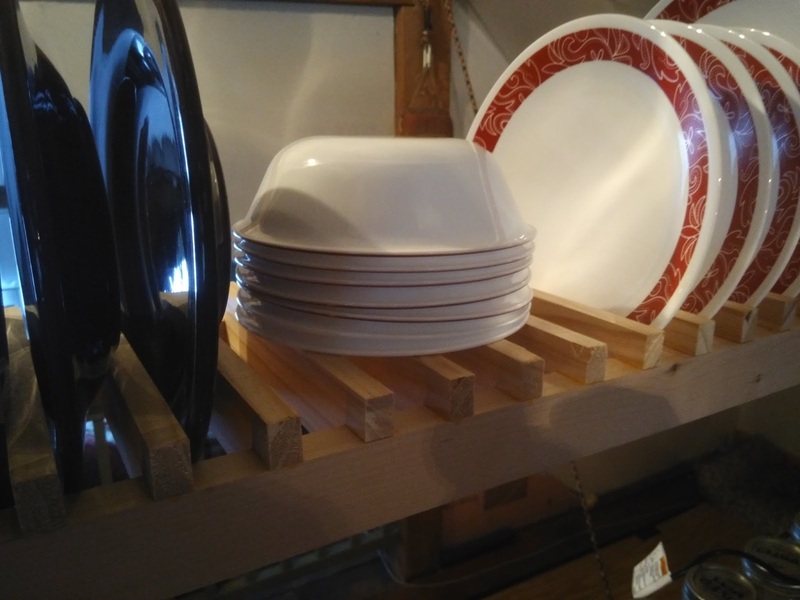 With no running water out here, this rack wouldn't be used for drying dishes, just for storing them, and freeing up a drawer. 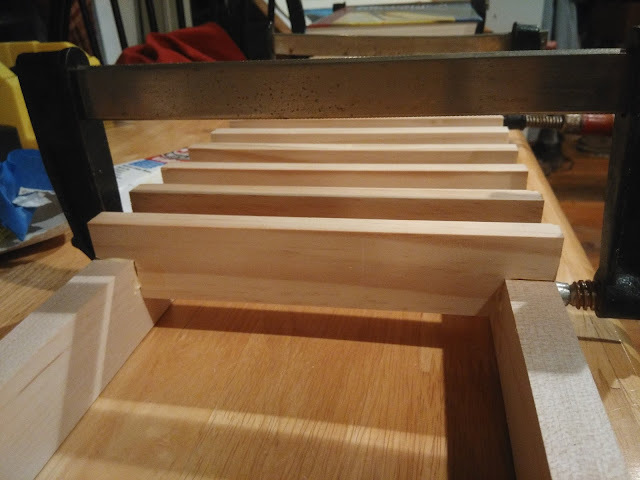 I sketched out a drawing and made some estimates, and bought several dozen 2" x 1/2" pine boards, as well as a pair of 8' long 2" x 3/4" maple boards. 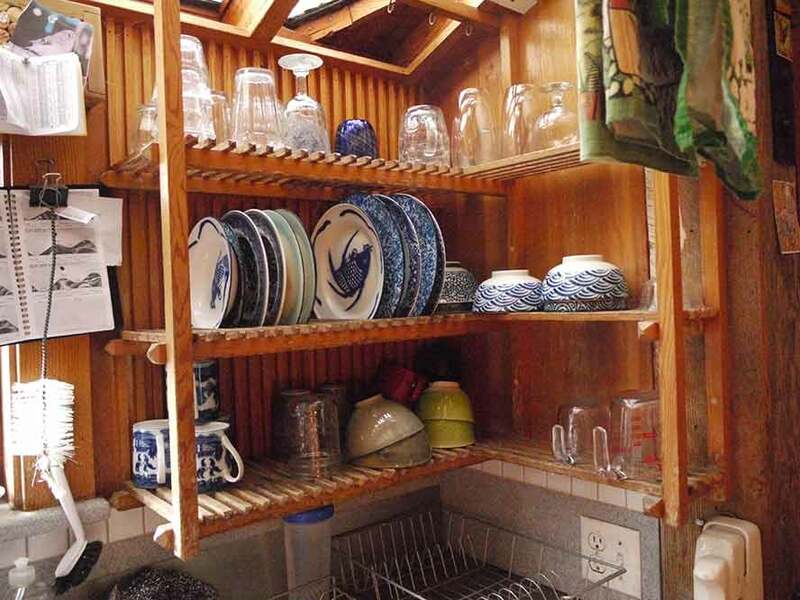 The maple would form the shape of the shelf, and the pine would make up the dish-rack slats. 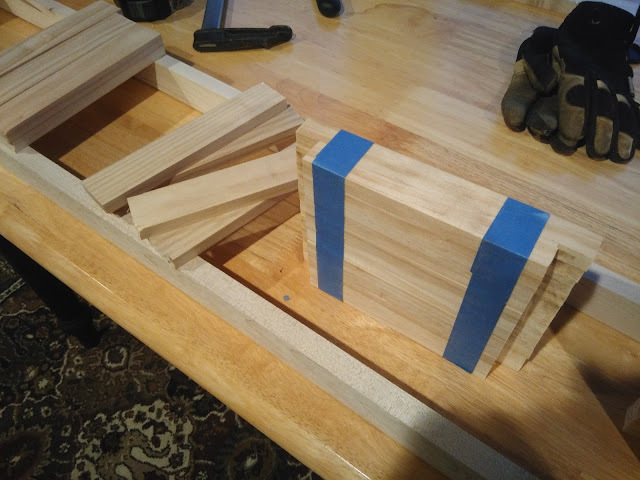 I cut the slats to shape by bundling them with masking tape, and running them through the table saw. This saved a lot of time! I glued each slat into position, and kept them snug with the maple rails using the weight of college textbooks (gotta get the value out of these things, they're way overpriced) and clamps. I had to play with the size of the gap. The plates all sit in between the slat comfortably. 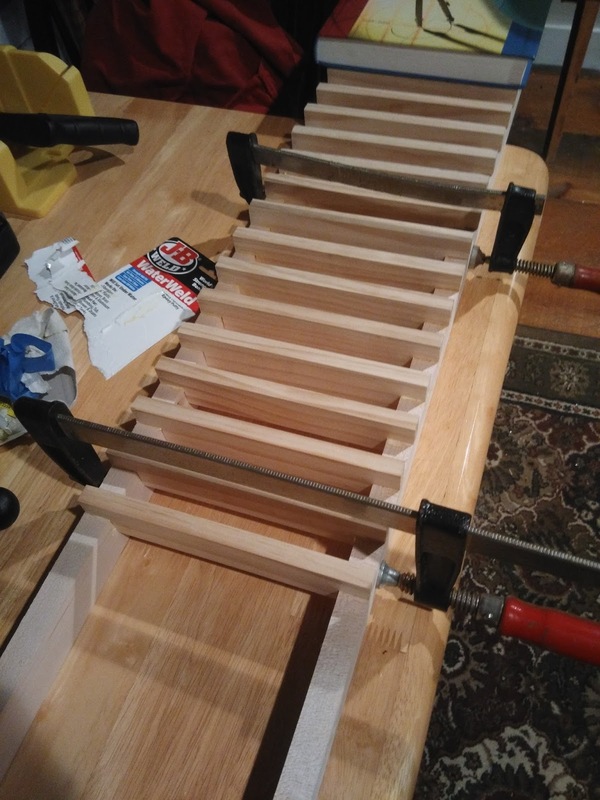 I could go with smaller slats when I make another one of these. The finished product was set upon a couple of lantern crates (these crates are good for just about everything.) I had been using these crates as a way of conveniently bringing a bunch of things up north to the bus, and as a bookshelf. Now I need more of them again.